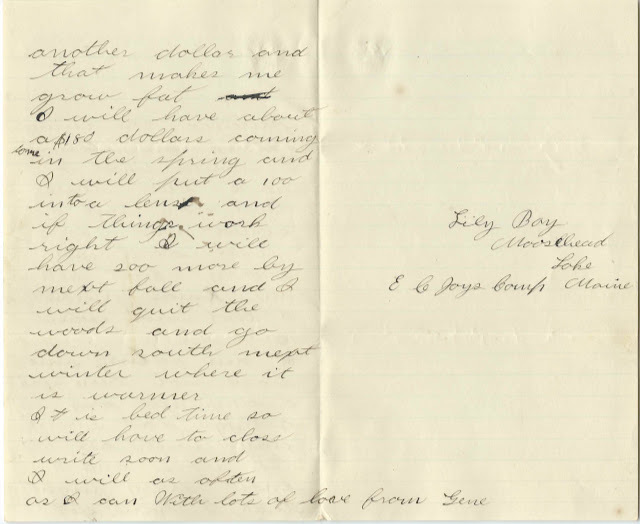 December 28, 1902 letter sent from Gene, who was working as cook at E. C. Joy's logging camp at Lily Bay, on Moosehead Lake in Maine, to his mother. Image and transcript at the end of this post. So Mrs. Messenger has come back to Maine and brought the bed wetter, has she. They are a funny lot, shure. I thought of you all Xmas and of Dan getting up and pulling the things out of his stocking. 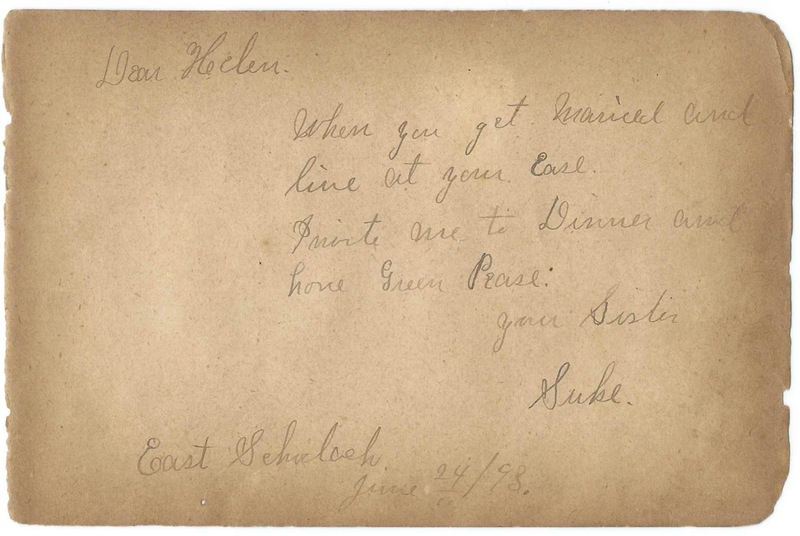 If you have a theory as to Gene's identity or information on the logging camp of E. C. Joy at Lily Bay on Moosehead Lake, near Greenville, Maine, please leave a comment or contact me directly. I have got a half hour before bed time and I will write a little, I guess. I don't have much time to write and when I do I am so tired that I don't feel like writing. We have fifty men now and I have got a boy to help me so I don't have to work so hard as I did last week. I had to work night and day and I told the boss that I had got to have a man to help me so this boy came in Sunday and he hired him. He can only talk French so we don't fight much. I can talk French some now, enough so I can tell him what I want hi to do. He is a good little fellow and a good boy to work. 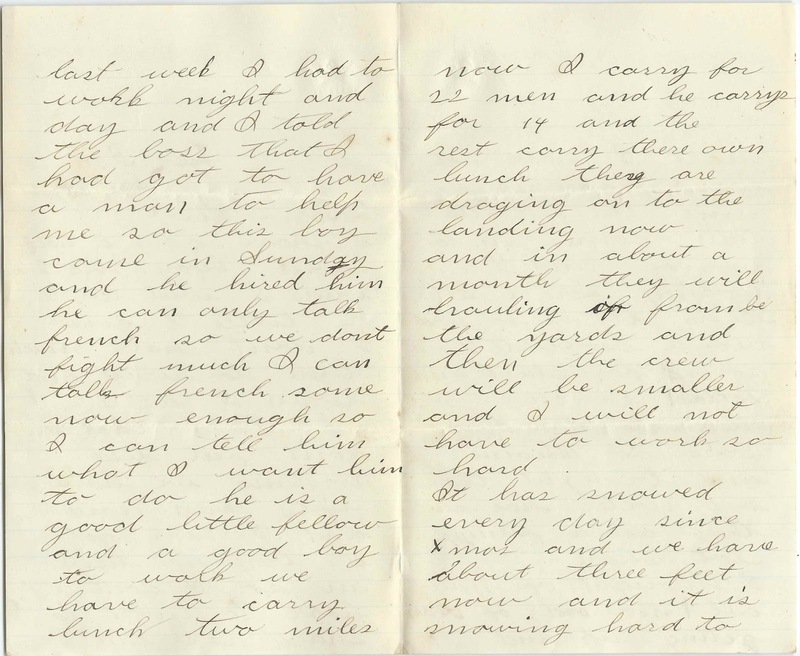 We have to carry lunch two miles now I carry for 22 men and he carries for 14 and the rest carry their own lunch. They are dragging on to the landing now and in about a month they will be hauling up from the yards and then the crew will be smaller and I will not have to work so hard. It has snowed every day since Xmas and we have about three feet now and it is snowing hard to night. I have not heard from you since the 20th. The toter comes in tomorrow and I am looking for a letter then. It is too bad about George Adell. I am sorry for Mert and Lottie! So Mrs. Messenger has come back to Maine and brought the bed wetter, has she. They are a funny lot, shure. I thought of you all Xmas and of Dan getting up and pulling the things out of his stocking. I would liked to have been there that day, but I could not very well. Don't you worry about getting me Xmas presents. I did not expect you to. I am feeling fine, have not been sick a day yet, am getting fat every day with all the work and I know every night that I have got another dollar and that makes me grow fat and I will have about $180 dollars coming to me in the spring and I will put a $100 into a lens and if things work right I will have 200 more by next fall and I will quit the woods and go down south next winter where it is warmer. It is bed time so will have to close. Write soon and I will as often as I can. 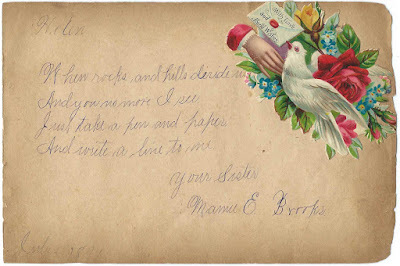 With lots of love from Gene. 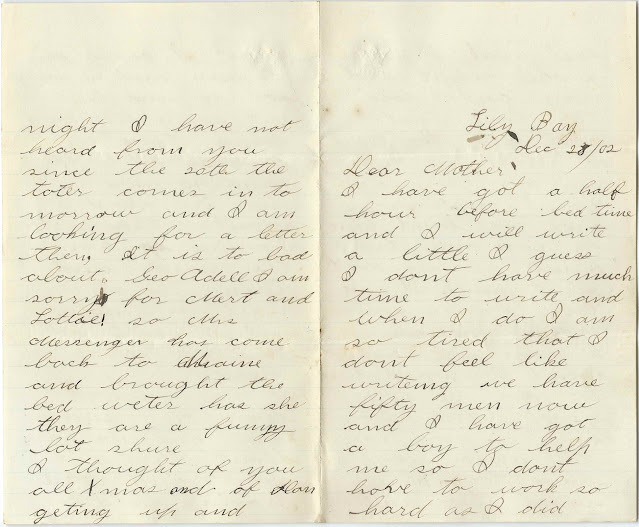 April 7, 1847 letter from Deacon Eliashib Adams of Bangor, Maine, to his oldest son, Rev. 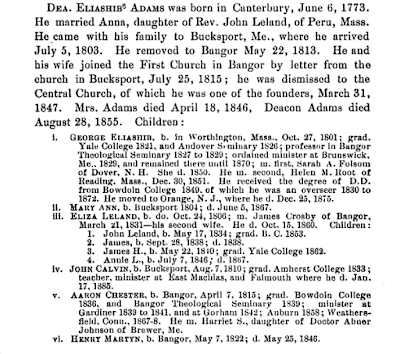 George Eliashib Adams at Brunswick, Maine. 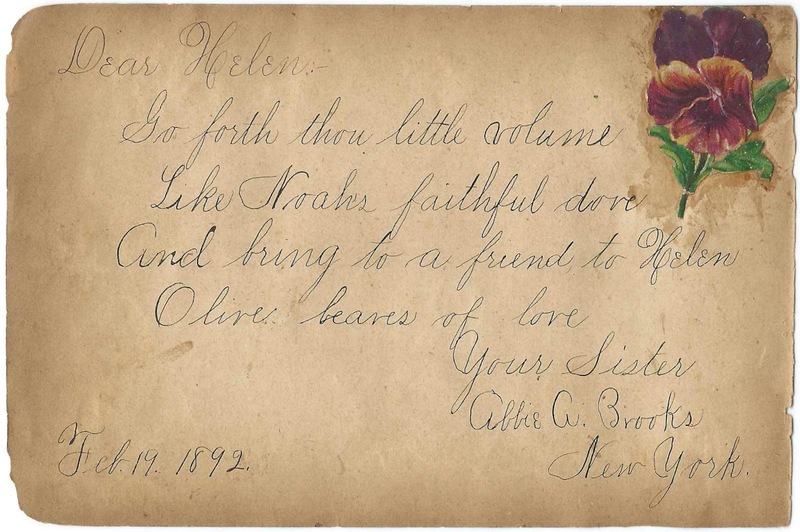 The reverse contains a note from Deacon Adams' daughter Mary Ann Adams. 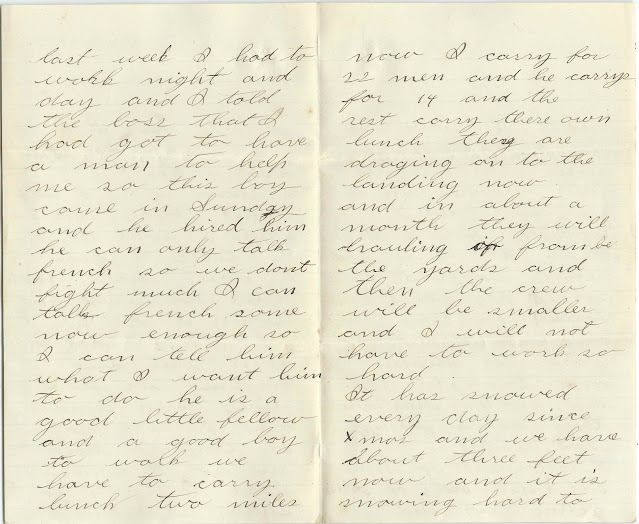 Transcript at the end of this post. 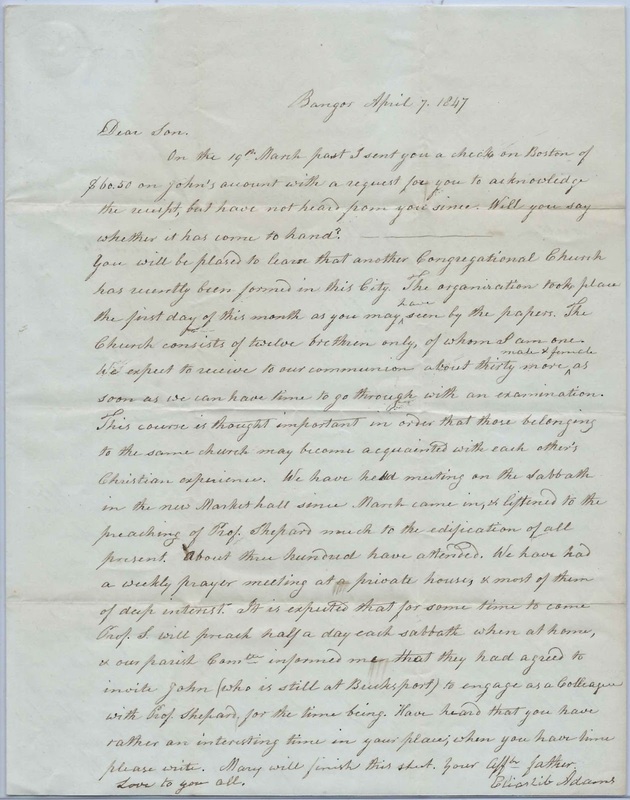 The letter contains news of the formation of a new Congregational parish in Bangor, Central Congregational Church, which existed from 1847 until 1911, when it and another church combined to form All Souls Church. 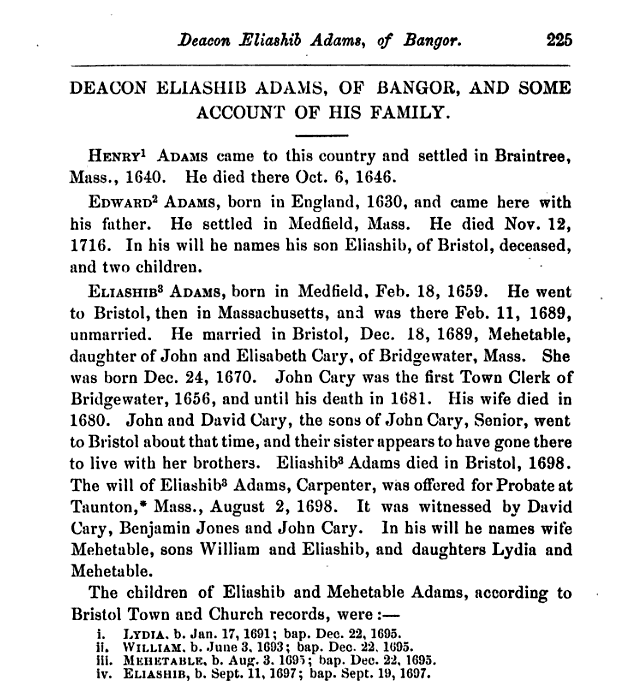 An issue of the Maine Historical Magazine, Volume 8, covering January 1893-December 1893, contains an article about the Adams family, including mention of the letter writer Deacon Eliashib Adams and his family. 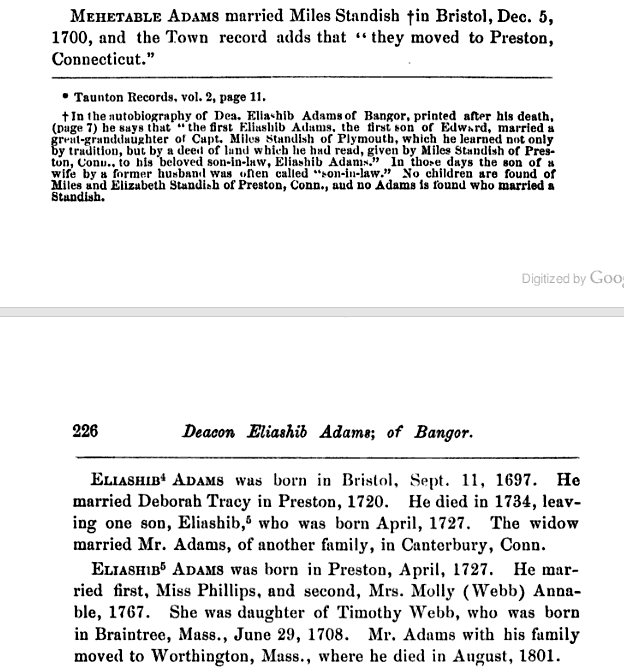 A highly interesting account of Deacon Eliashib Adams, his son Rev. 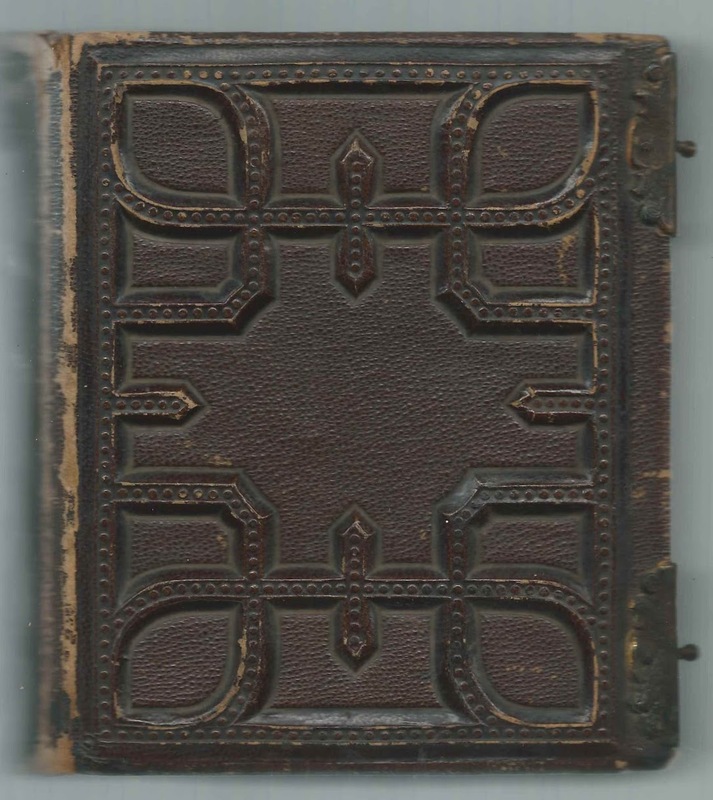 George Eliashib Adams and other family members is contained in the book Fanny & Joshua: The Enigmatic Lives of Frances Caroline Adams & Joshua Lawrence Chamberlain, written by Diane Rowe Smith and published in 2013. 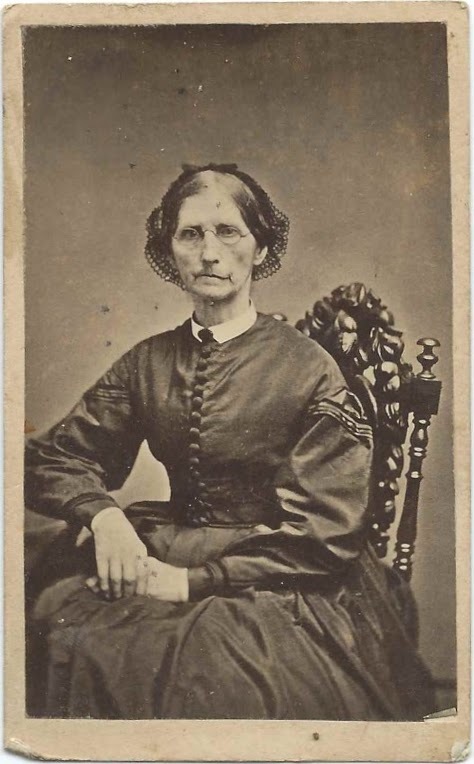 Frances Caroline Adams, "Fanny", and the much older Rev. George Eliashib Adams were cousins. 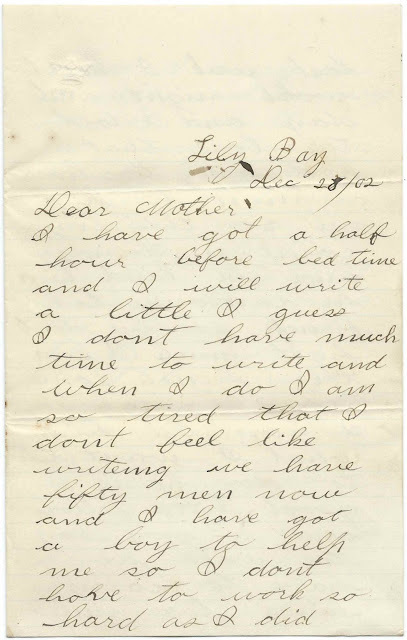 When "Fanny" was four, Rev. Adams and his then wife Sarah Ann (Folsom) Adams took Fanny into their Brunswick home as their adopted daughter. 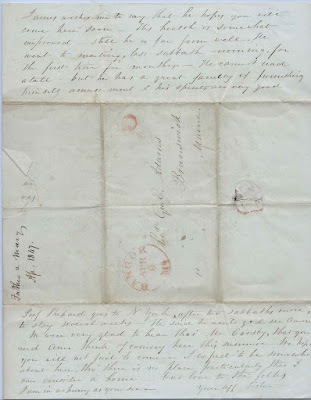 On the 19th March past I sent you a check on Boston of $60.50 on John's [possibly John Calvin Adams, Eliashib Adams' second son] account with a request for you to acknowledge the receipt, but have not heard from you since. Will you say whether it has come to hand? You will be pleased to learn that another Congregational Church has recently been formed in this City. The organization took place the first day of this month as you may have seen by the papers. The Church consists of twelve brethren only, of whom I am one. We expect to receive to our communion about thirty more, male and female, as soon as we can have time to go through with an examination. This course is thought important in order that those belonging to the same church may become acquainted with each other's Christian experience. We have held meeting on the Sabbath in the new Market hall since March came in, and listened to the preaching of Prof. Shepard much to the edification of all present. About three hundred have attended. We have had a weekly prayer meeting at private homes, most of them of deep interest. 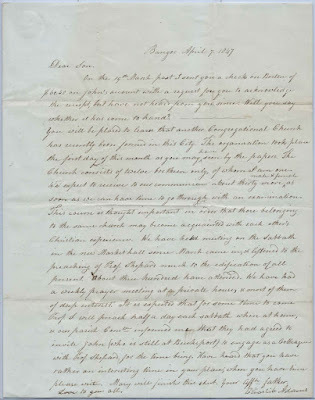 It is expected that for some time to come Prof. S. will preach half a day each sabbath when at home, and our parish committee informed me that they had agreed to invite John (who is still at Bucksport) to engage as a Colleague with Prof. Shepard, for the time being. Have heard that you have rather an interesting time in your place; when you have time please write. 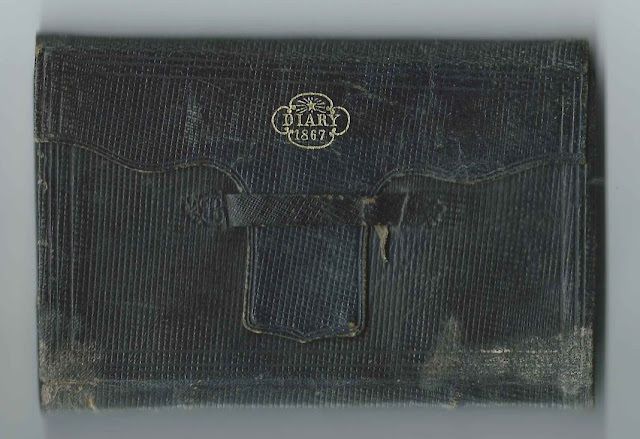 Mary will finish this sheet. 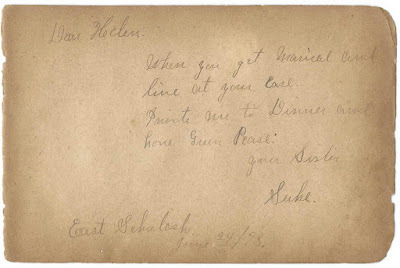 Your affectionate father, Love to you all, Eliashib Adams. 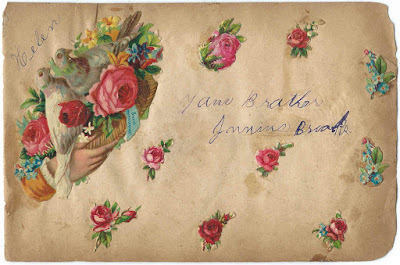 James wishes me to say that he hopes you will come here soon. His heath is somewhat improved. Still he is far from well. We went to meeting, last sabbath morning, for the first time for months. He cannot read at all but he has a great faculty of furnishing himself amusement and his spirits are very good. 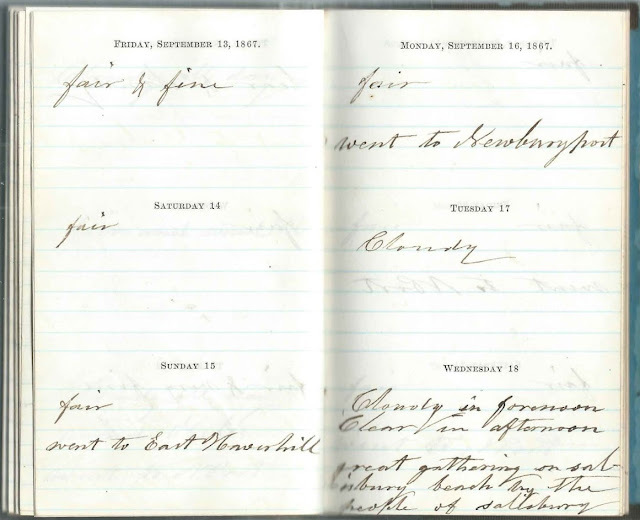 Prof. Shepard goes to New York after two sabbaths more, to stay several weeks. 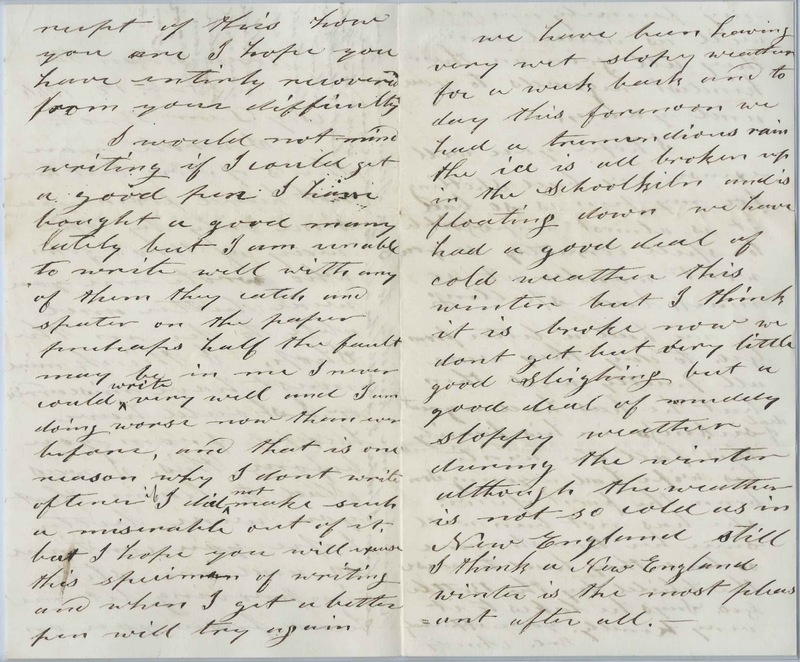 He said he would go and see Aaron [presumably Aaron Chester Adams, third son of letter writer Deacon Eliashib Adams]. 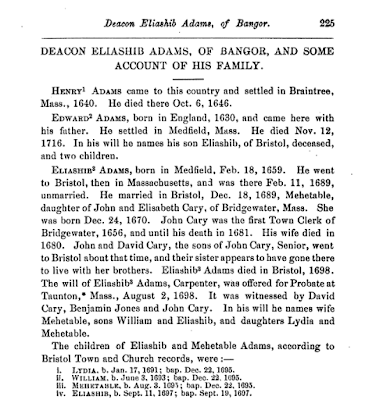 If you have more information on Deacon Eliashib Adams and his family, please leave a comment or contact me directly. 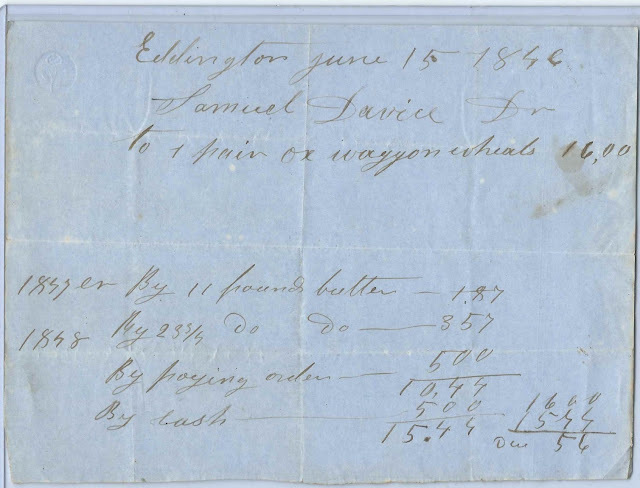 1846 invoice dated June 15, 1846 at Eddington, Maine. 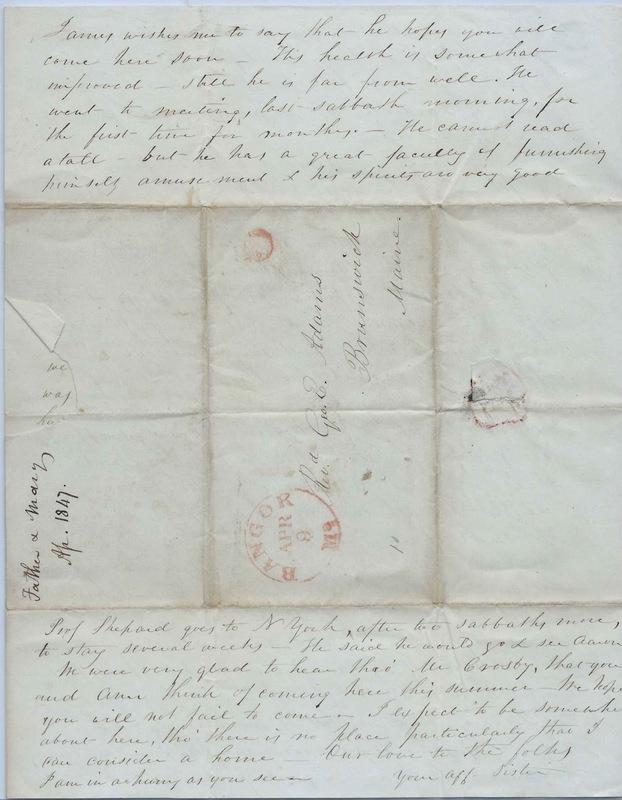 The handwritten document contains two names, that of Samuel Davice, who was presumably Samuel Davis, and J. Muzzy. 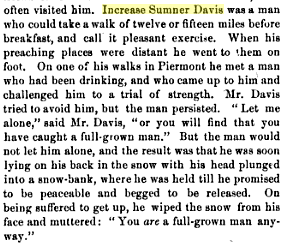 There were several men named Samuel Davis living in the area of Eddington, Maine, and abutting Clifton, Maine, during this time frame. 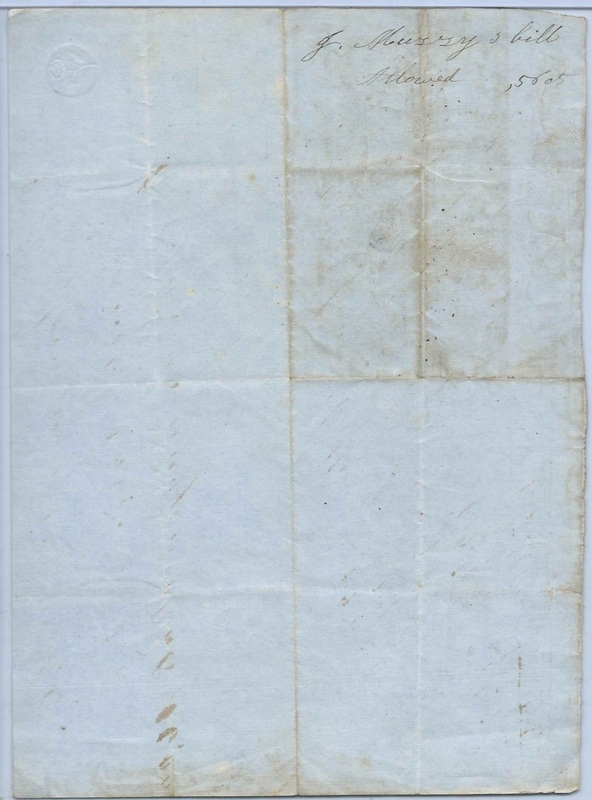 See another post that features a promise to pay document, also dated in 1846 and at Eddington, Maine, between Samuel Davis and Bartholomew Davis Penney. Whether this is the same Samuel Davis or one of the others, I don't know. There were also several possibilities for a J. Muzzy, including Jacob Muzzy and Joel Muzzy. The latter, however, was a cabinetmaker and carriage maker, so this bill for a pair of ox wagon wheels makes Joel Muzzy look very plausible as the maker of the invoice. 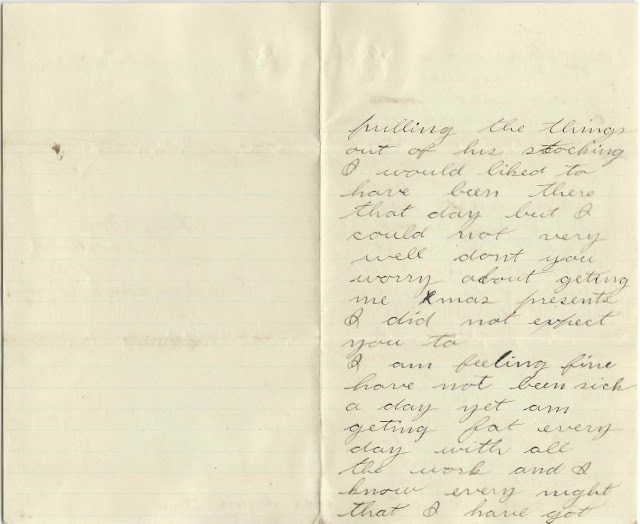 If you have information on either Samuel Davis or a J. Muzzy from the Eddington, Maine, area, please leave a comment or contact me directly. 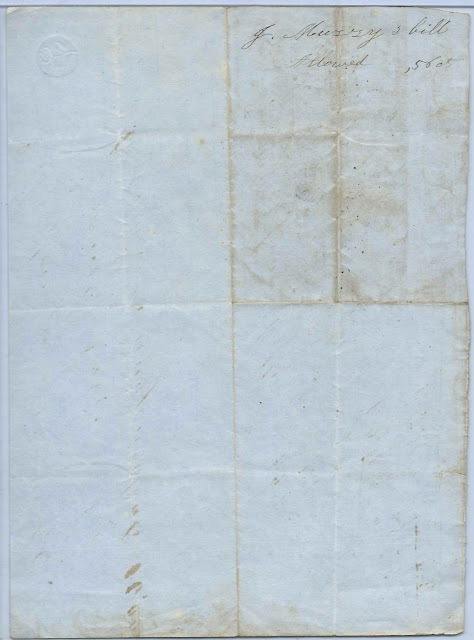 November 29, 1846 document from Eddington, Maine, where Samuel Davis promised to pay Bartholomew Penney $49 and interest by December 1, 1847. Note: See another post that features an invoice dated 1846 also at Eddington, Maine, for a pair of ox wagon wheels that J. Muzzy made for Samuel Davis. 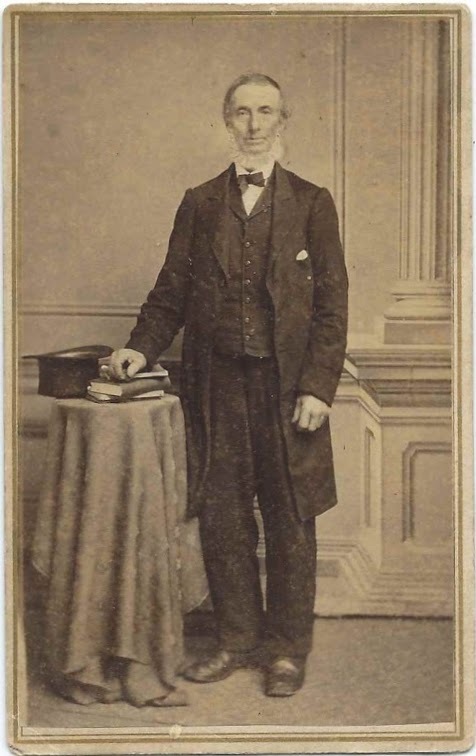 There was more than one Samuel Davis living in the Eddington, Maine, and Clifton, Maine area at that time. 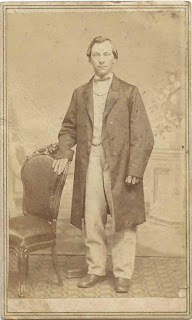 Bartholomew Davis Penney was born about 1820, the son of Joseph and Sarah Jane (Davis) Penney. Bartholomew apparently also went by the name Davis B. Penney, as he was recorded by that name on a Civil War Draft Registration list. I don't believe Bartholomew married. 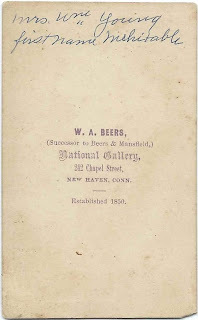 He died July 5, 1864 and is buried in the Pine Tree Cemetery at Eddington, Maine, together with his parents and other relatives. 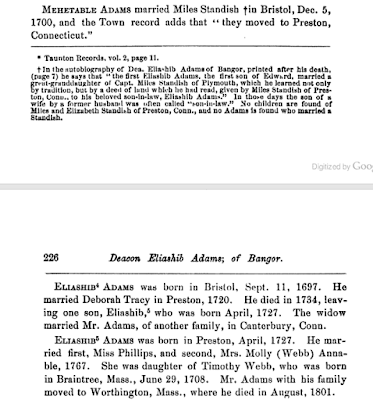 I wonder if Samuel Davis was related to Bartholomew's mother's Sarah Jane (Davis) Penney. 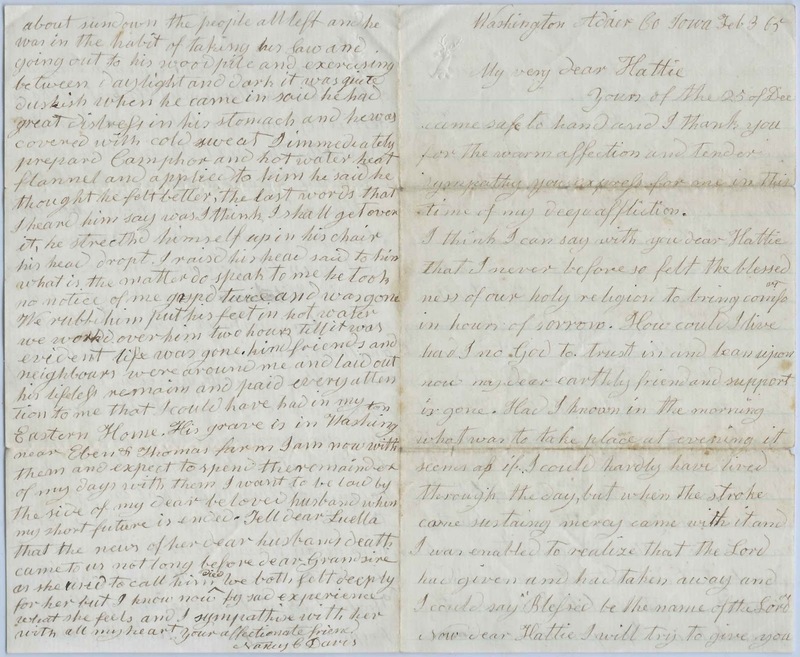 If you have corrections and/or additions on Bartholomew Davis Penney, or a theory as to which Samuel Davis wrote the document, please leave a comment or contact me directly. 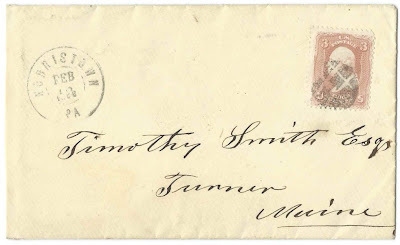 February 12, 1866 letter from Amos Smith at Norristown, Pennsylvania, to his brother Timothy Smith at Turner, Maine. The letter consists of one sheet folded into four panes and contains family news. 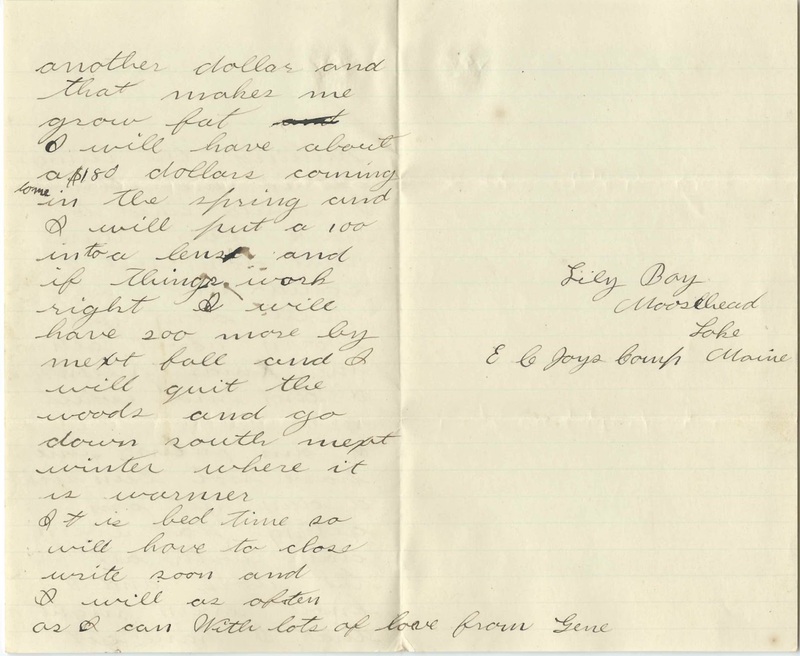 See a transcript of the letter at the end of this post. 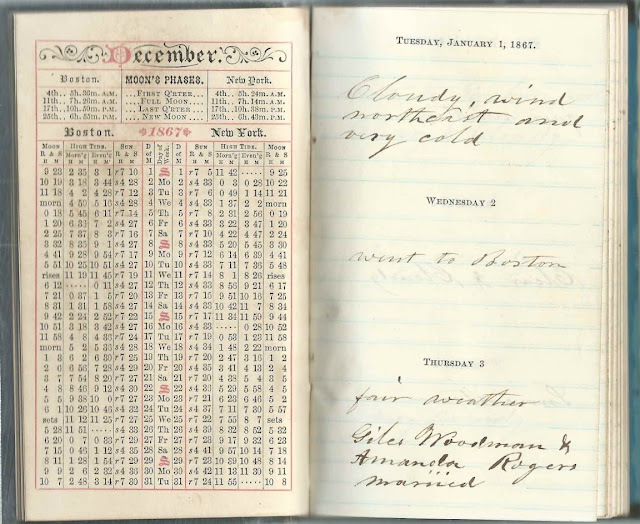 Amos Smith was born December 16, 1797 in New Hampshire, the son of Caleb and Mary (Tuck) Smith. His brother Timothy Smith was born January 27, 1801 in New Hampshire. 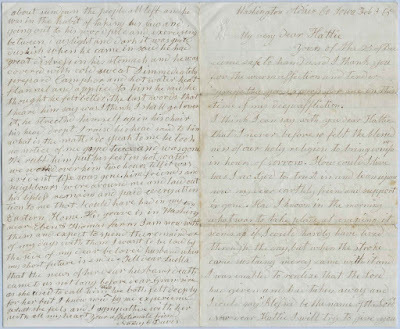 Mentioned in the letter is their oldest brother John Smith, who was born April 27, 1785. 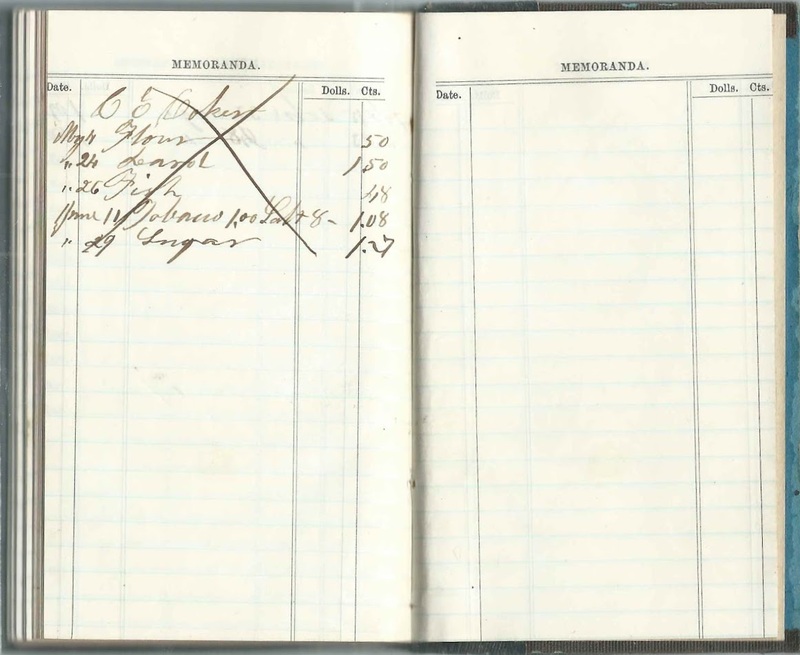 Interestingly, there was a John Smith living at Norristown, Pennsylvania, at least at the time of the 1840 Census. Amos Smith died a few months shy of his 100th birthday, at Philadelphia, Pennsylvania, on May 5, 1897 and is buried there in the Woodlands Cemetery. 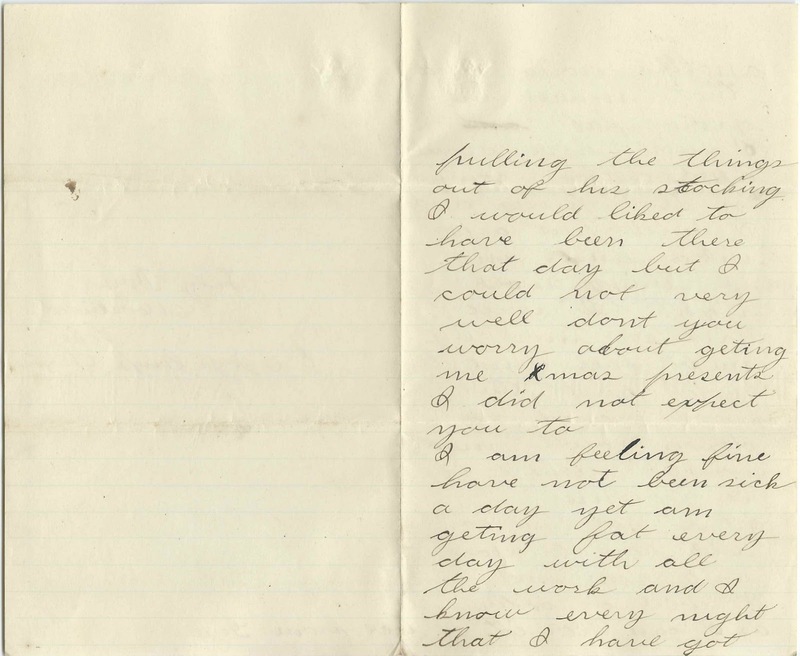 In the letter, Amos mentioned his son George Littlefield Smith and family, then living at Prattsville, Alabama. 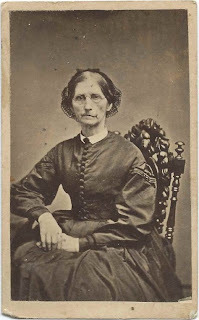 He revealed that George's wife, Abigail Flint (Holt) Smith, hadn't felt herself since the birth of her son Amos Littlefield Smith on November 2, 1865. Fortunately, Abigail survived the ordeal and lived until 1914. 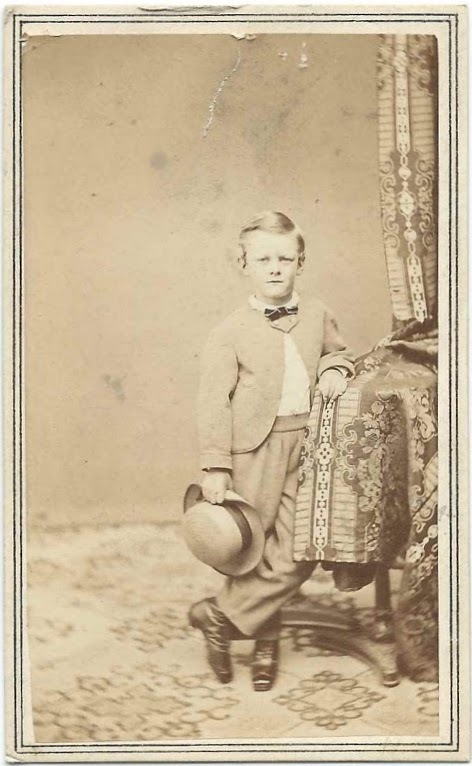 Aurelius Marcus Smith, born about December 1828. Timothy Smith died April 12, 1866 according to his gravestone and a partial recreation of a Maine death record, but many sources online have his death a year to the day later. He's buried in the Turner Village Cemetery. Pane 2: receipt of this how you are. I hope you have entirely recovered from your difficulty. I would not mind writing if I could get a good pen. I have bought a good many lately but I am unable to write well with any of them. They catch and spatter on the paper. Perhaps half the fault may be in me. 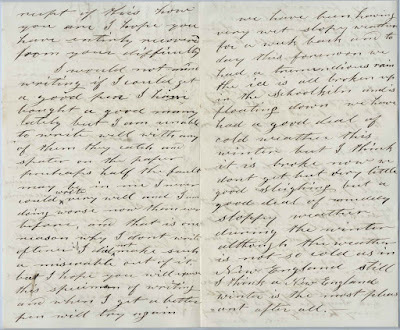 I never could write very well and I am doing worse now than ever before, and that is one reason why I don't write often, I did not make such a miserable out of it, but I hope you will excuse this specimen of writing and when I get a better pen will try again. 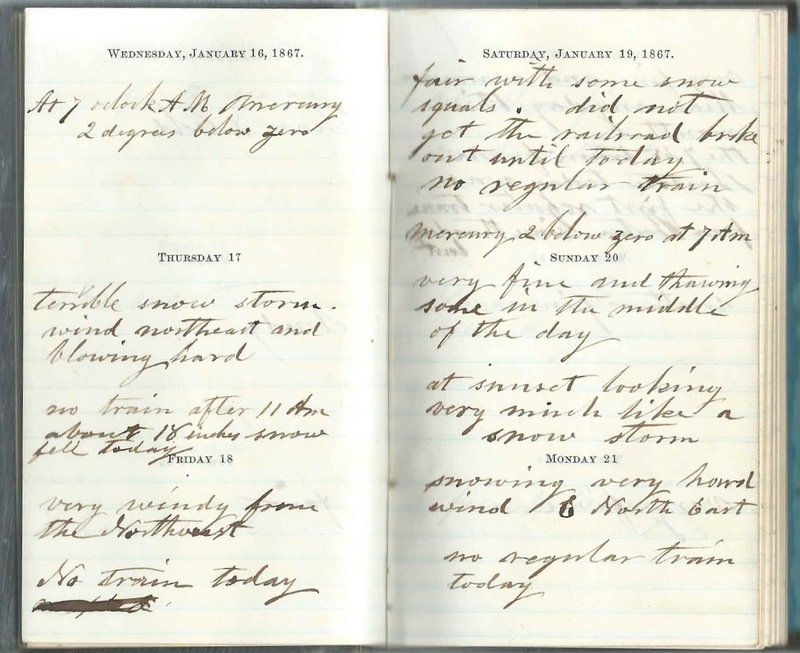 Pane 3: We have been having very wet sloppy weather for a week back and today this forenoon we had a tremendous rain. The ice is all broken up in the Schoolkill [Schuylkill River], and is floating down. We have had a good deal of cold weather this winter but I think it is broken now. We don't get but very little good sleighing but a good deal of muddy sloppy weather during the winter, although the weather is not so cold as in New England. Still I think a New England winter is the most pleasant after all. Pane 4: My family are all well as usual and they all join in their kindest regards to you and yours. I hope you will excuse my bad spotting for my pen is so bad. It is almost impossible to spell correctly so you won't wonder at so much bad spelling. 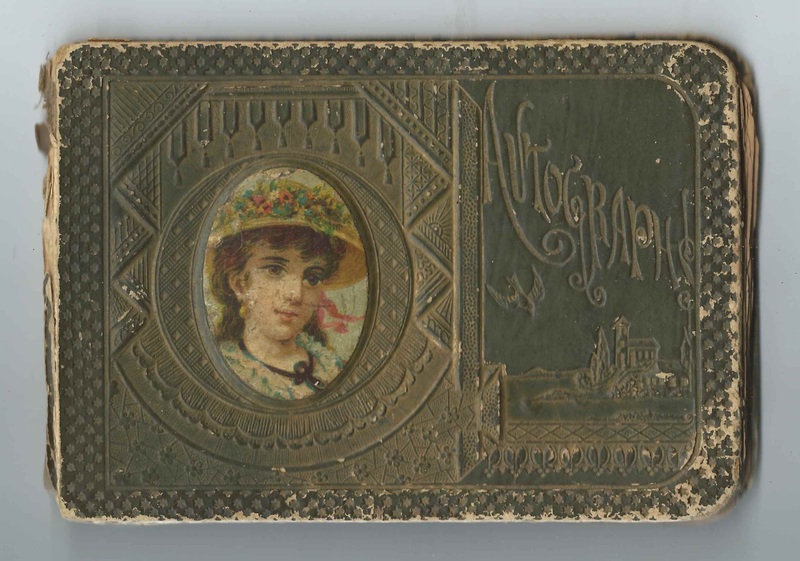 19th century album of 49 carte de visite photographs and one tintype. 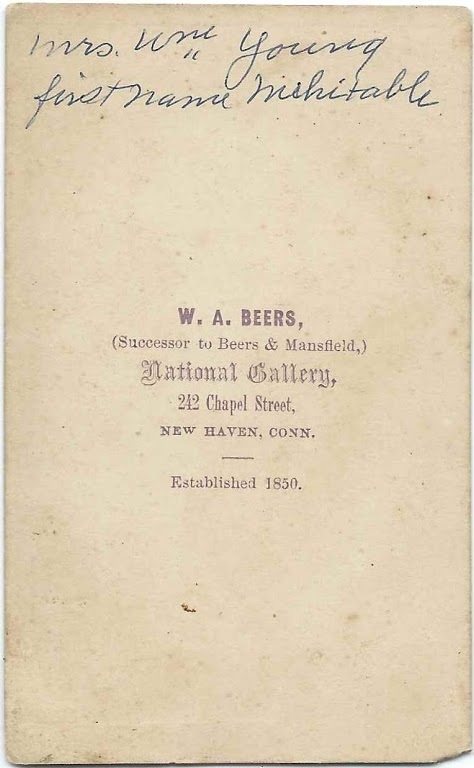 48 of the CDVs were produced by Connecticut studios; the other, of William Clark Young, was produced by the Ingraham Brothers studio of Northampton, Massachusetts. The album measures approximately 5-3/4" by 5" y 2+". 20 of the photographs have identification written on the reverse and repeated on the pages in which they are slotted. 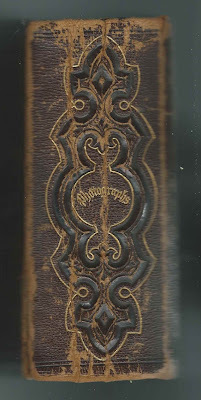 An alphabetical list of those identified and a list of the unidentified photographs, together with any studio markings, appear at the end of this post. Sadly, the index page is blank. Three of the CDVs have stamps on the reverse, a 3-cent stamp and two 2-cent stamps. The oldest identified people in the album are William Clark Young and his wife Mehitable Utley (Swift) Young. 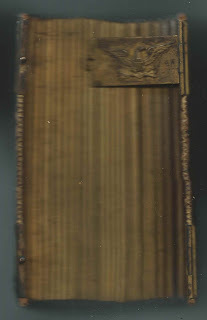 The album contains two photographs of William. Capt. William Clark Young, Jr., was born August 28, 1803 at Lisbon, Connecticut, the son of William Clark Young and Anna Nancy (Crane) Young. 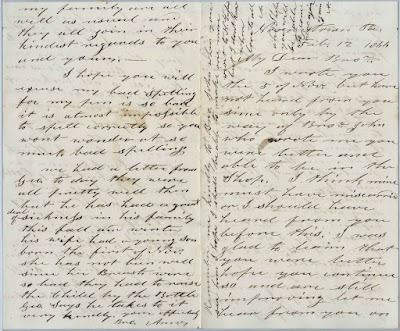 Mehitable Utley Swift was born March 19, 1807 at Warren, New York, the daughter of Ira and Sarah (Robinson) Swift. Mehitable died in 1881 and Capt. Young in 1892. 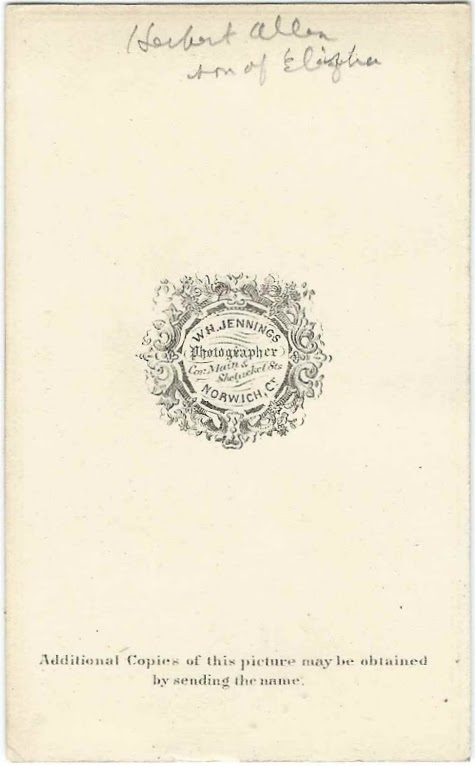 Two CDVs may show Elisha Morgan Allen and his son Elisha Hubert Allen, though the latter was identified as Herbert, and the former was identified only on the page holding the CDV, not on the CDV itself, which would be more reassuring. If you have corrections and/or additions to the information above, or information on any of the people identified in the album, please leave a comment or contact me directly. 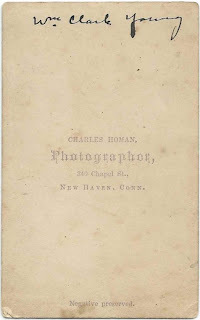 Charles Gaylord; CDV taken by Bundy & Williams of 314-326 Chapel Street, New Haven, Connecticut. 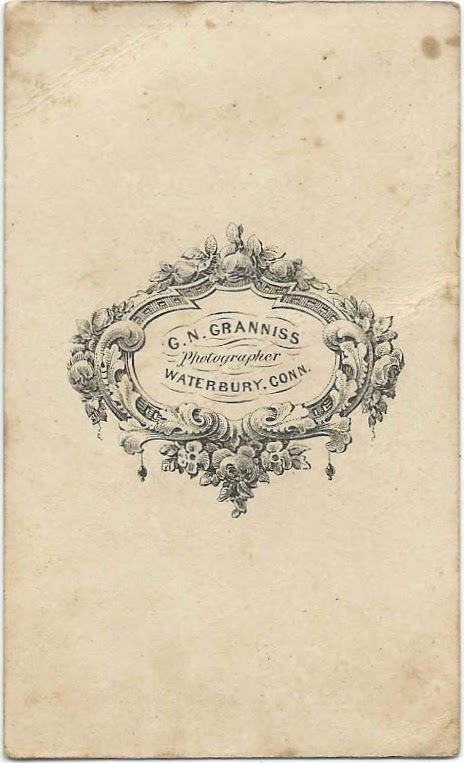 Two cent stamp on the reverse. William C. Young; CDV taken by Ingraham Brothers of Northampton, Massachusetts. 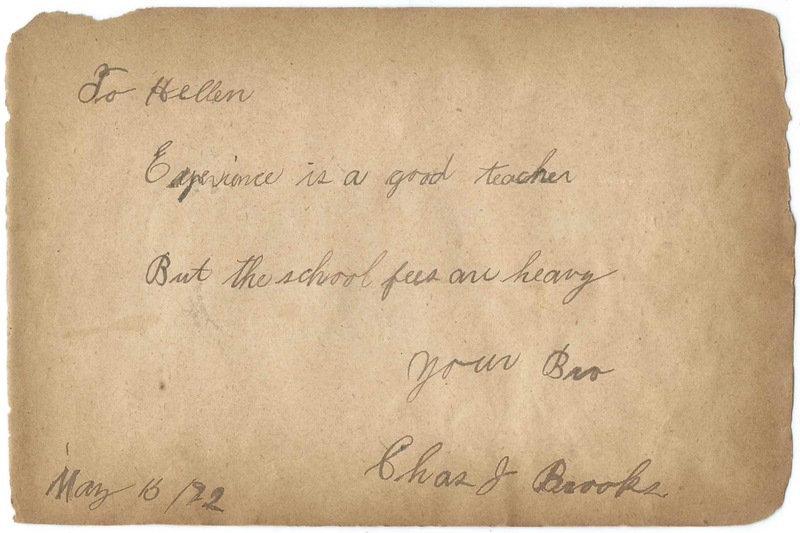 Presumably the William Clark Young identified in another CDV. 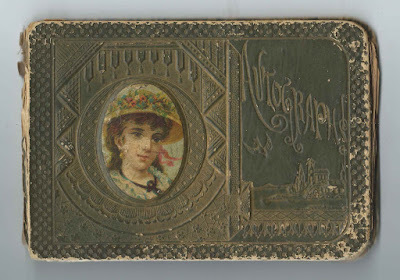 CDV of an unidentified young woman; taken by the studio of J. L. Judd of Litchfield, Connecticut. 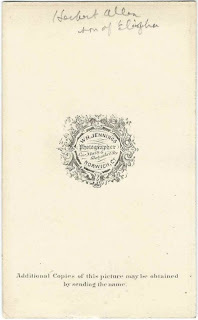 Two cent stamp on reverse. 1867 diary that may have belonged to Charles Edward Coker of Newbury, Massachusetts. 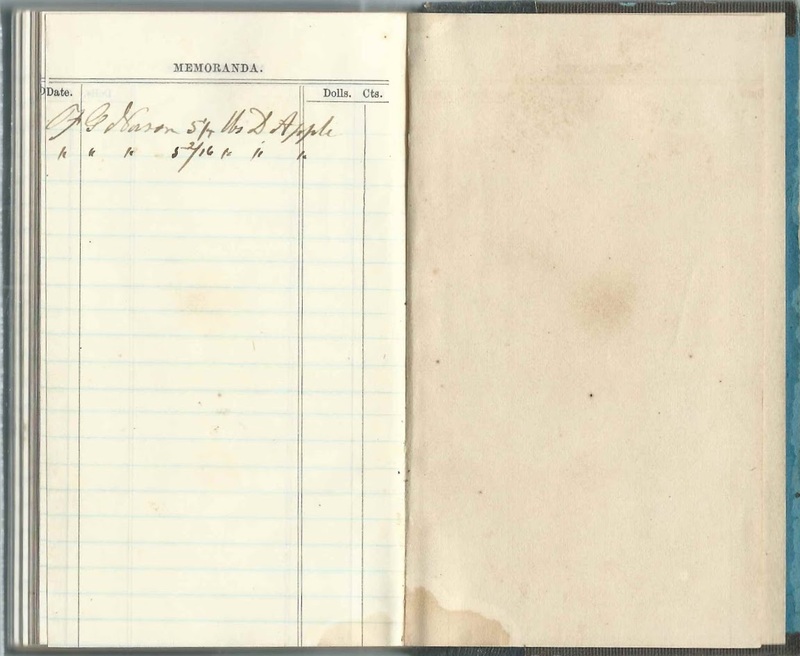 His name appears in the Memoranda section, along with a name that appears to be F. G. Nason. The diary measures about 4-3/4" by 3-1/4" and contains many pages of information, the diary section, a cash account section and two sections entitled Memoranda. The entries consist almost entirely of laconic descriptions of weather conditions and trips to nearby towns and Boston, with countless trips to "NPort", Newburyport. 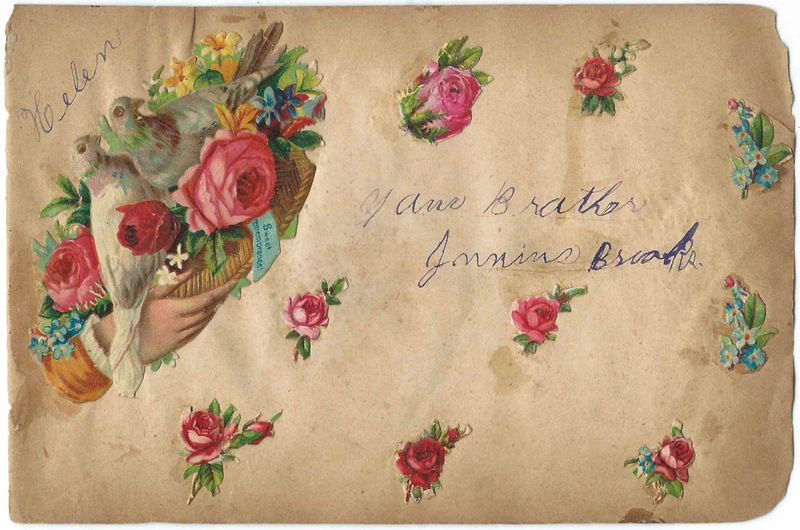 Sadly, there's no mention of celebrations of birthdays, Thanksgiving or Christmas, but there is mention of several people; see more details and images farther below. 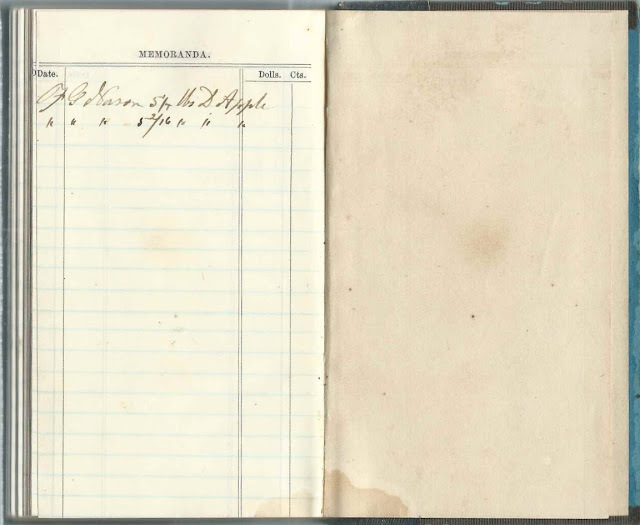 The owner was a farmer, but his many trips may indicate that he had other business interests as well. He mentioned his salt marsh hayfields, which he mowed in the first half of August, the butchering of two hogs and the acquisition of a cow. Charles Edward Coker was born April 1, 1830 at Alna, Maine, the son of Stephen and Harriet C. (Pearson) Coker. 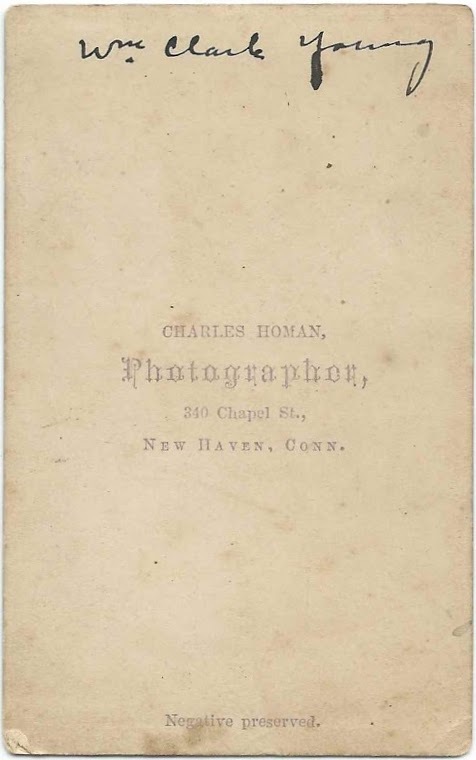 In 1854, Charles married Sarah Jane Noyes, daughter of Daniel and Sarah (Pearson) Noyes. Perhaps Charles and Sarah met because their mothers may have been related. 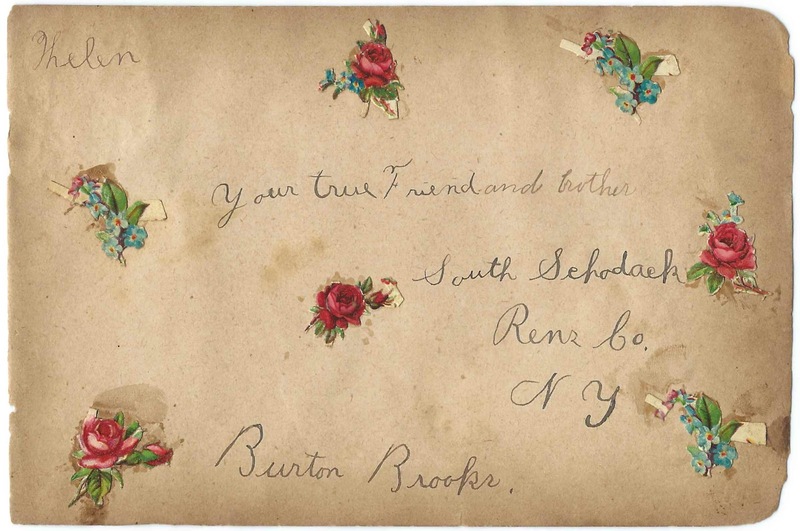 If you have more information on Charles Edward Coker, especially if you have found that he had salt marsh fields and had reason for frequent travel to Newburyport and Boston, please leave a comment or contact me directly. 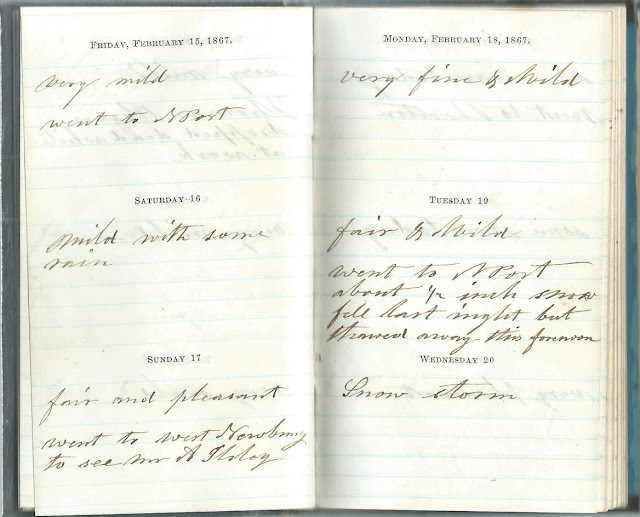 The entry for Thursday, January 3, 1867, mentions the marriage of Giles Woodman and Amanda Rogers. 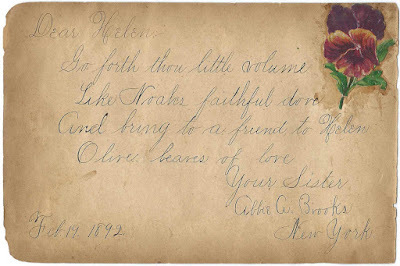 Giles was the son of Giles and Lydia (Floyd) Woodman; Amanda was the daughter of Pelatiah and Cordelia (Rogers) Rogers. 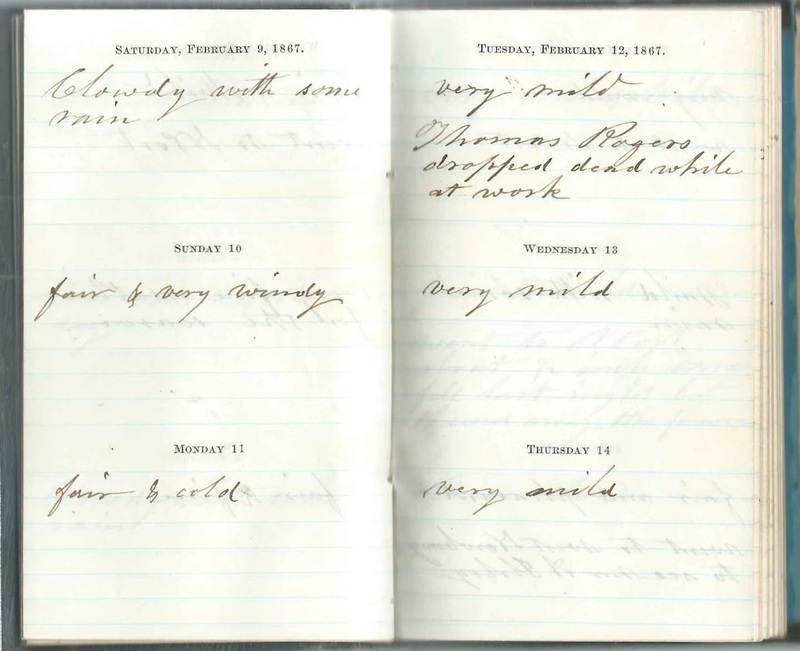 The entry for Tuesday, February 12, 1867 mentions the death of Thomas Rogers, who dropped dead while at work. Thomas, born December 7, 1793 at Newbury, Massachusetts, was the son of Aaron and Lois (Rogers) Rogers. 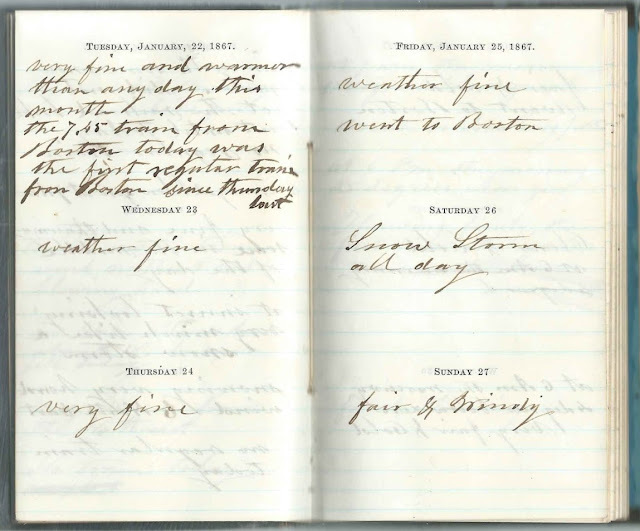 The entry for Sunday, February 17, 1867 mentions that the diary owner visited Mr. A. Ilsley at West Newbury, Massachusetts. He was presumably Alfred Bradford Ilsley (1828-1868), son of Jonathan and Mary Goodridge (Bowley) Ilsley. 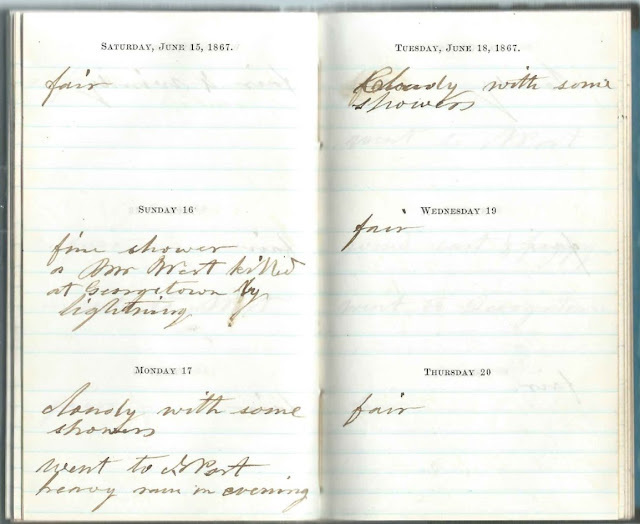 The entry for Sunday, June 16, 1867, mentions the death at Georgetown, Massachusetts, of a Mr. West, who was struck by lightning. 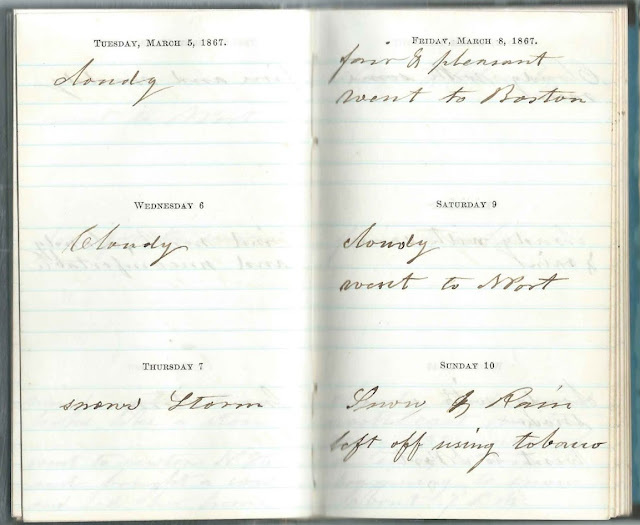 Interestingly, there was a George West who died that day at Georgetown, Massachusetts. 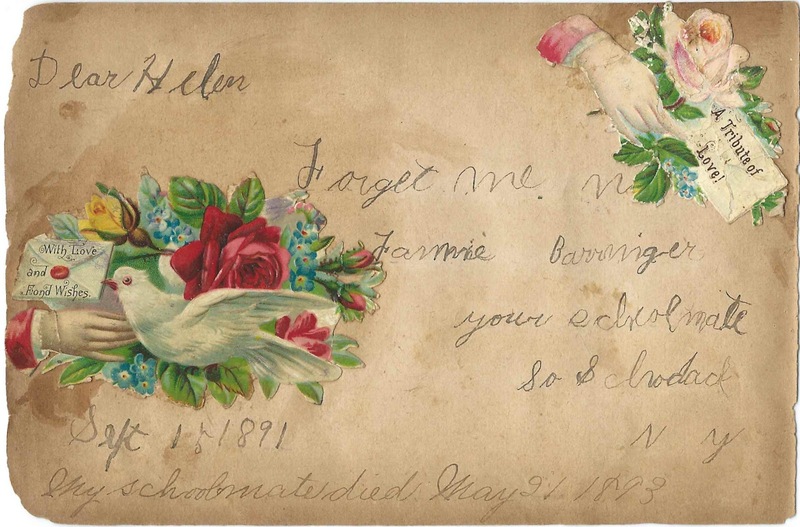 He was born March 10, 1802 at Haverhill, Massachusetts, son of Richard and Mary (Haseltine) West. 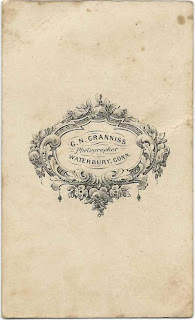 George West is buried at Danvers, Massachusetts. The entry of Wednesday, September 18, 1867 mentions a "great gathering on Salisbury beach by the people of Salisbury. Interestingly, the Beach Road, which crossed the extensive marshes and gave access to five miles of beaches, was completed in 1866. Perhaps this gathering was commemorating the anniversary of the road's completion. 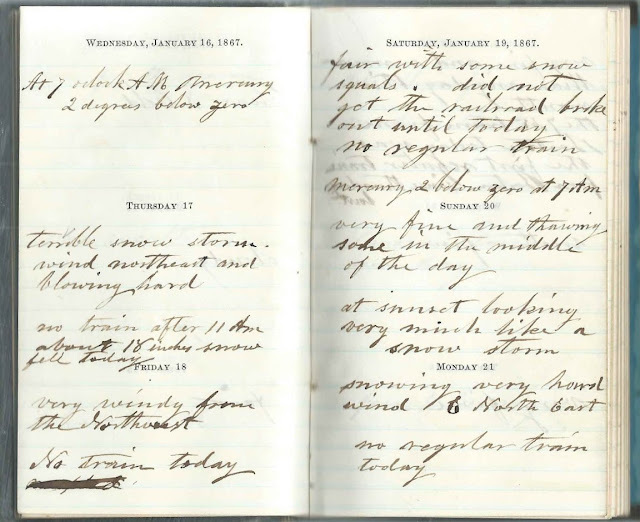 The Newbury area experienced a storm in mid January 1867 that prevented train access for a few days. 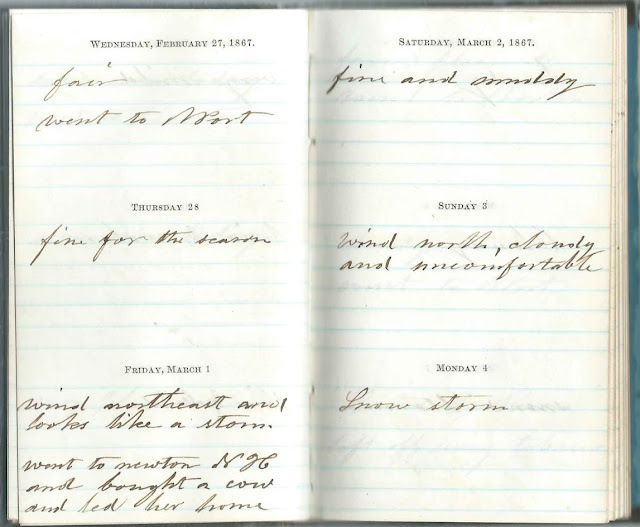 On Friday, March 1, 1867, the diary owner purchased a cow at Newton, New Hampshire, and led her home. On Sunday, March 10, 1867, the diary owner indicated he had sworn off tobacco. 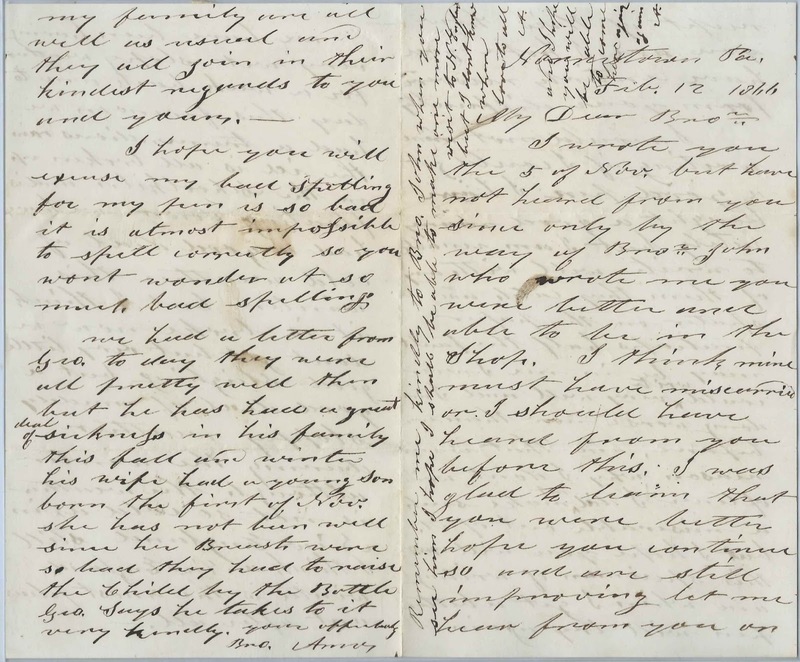 If indeed the diary owner was Charles Edward Coker, he may have taken up the habit again, as there's mention of a tobacco purchase in one of the memoranda sections; see the second image from top. 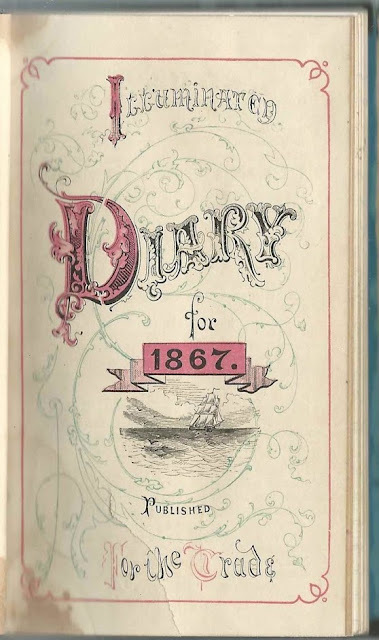 If you have corrections to the information above, a theory as to the diary owner's identity, or information on any of the people mentioned in the diary, please leave a comment or contact me directly.